Today, I get the honor of featuring a couple new products of theirs - personalized newborn gift packages and gift tags! The colorful new Family Labels gift packages for newborns include a onesie, a bib and a durable bag tag that's perfect for diaper bags or strollers. The onesie and bib are made of high quality 100% cotton and are printed using state-of-the-art direct to garment technology. Plus the water based inks are very durable and 100% Child Safe! The onesies are available in 6, 12, 18 & 24 month sizes. The bag tag is made of durable frost colored plastic and includes a premium grade genuine white leather strap with a strong silver buckle. The (Non-Personalized) Gift Labels and Gift Stickers are for the entire family. Stop running to the store when you need a gift card. Save time and money by placing gift stickers right on your birthday presents. You can hoose from a variety of really cool original designs that are printed with vibrant colors on bright white labels. 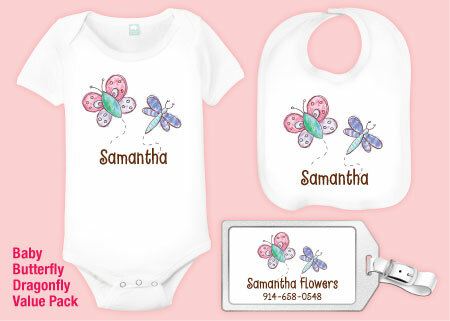 I generously received the super cute Baby Butterfly Dragonfly newborn package with my daughter's (secret) name on them! They are so cute and will be so comfortable on my daughter! 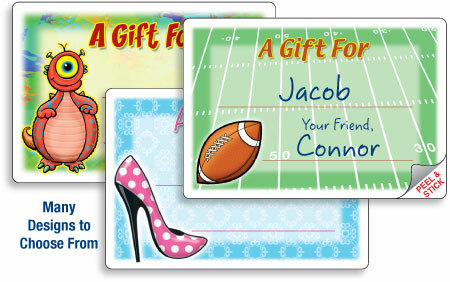 The non-personalized gift tags are also a great idea! I love all the cute and different designs - there is literally one for each personality and person you are gifting too! The labels are easy to address to whomever you want! Family Labels have come through again with some great personalized and non-personalized products! They are so colorful, fun and great ideas. The newborn gift package makes a great shower gift and the gift tags save you time and money when gift wrapping! Buy It: You can purchase both the newborn gift packages and the gift labels on the Family Labels website. Family Labels is generously offering a 10% discount code for all my great readers! Just enter the discount code "STEW"